4 X 14 Classic Floor Register - Satin Anodized Discounts Apply ! Floor Registers by Hart and Cooley in the Satin Anodized model will give your floors the unique look you have been searching for. 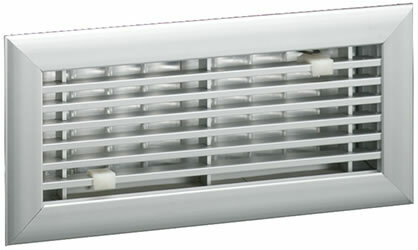 This unusual looking register has a subtle, light silver look, unlike the bright look of chrome. Made of aluminum with heavy cross bracing reinforcement, the floor register cover is made to be corrosion resistant. Adjustable air control is managed by the dual multi-shutter valves. Use the easy to access slide valves to make air flow a snap. This hard to find 4 x 14 inch Satin Anodized Floor Register by Hart and Cooley is perfect for the floor that needs a contemporary upgrade, without a shiny appearance. ***Hint: The industry standard is to order using the actual hole opening size and not the faceplate size. This Satin Anodized Floor Register will fit a 4 x 14 inch hole opening. Actual Faceplate Dimensions: 5 1/2 inches x 15 1/2 inches.